"When I’m doin’ it on stage.. you have to put on a show. If I just stood out there and sang and never moved a muscle, the people would say ‘my goodness, I can stay home and listen to his records’. You have to give them a show, something to talk about." I just picked up the Oxford American special music issue with the emphasis on southern music. The writer of the Elvis piece, Alan Light, opens his piece by describing the term "Elvis in Vegas" as kind of shorthand "for showbiz Emptiness, sloth & tackiness". The rest of the article actually goes on to refute some of that idea, at least for Elvis early Vegas seasons. Other writers however do not even go this effort. It's important to realize that Elvis' Vegas years (1969-1976) were full of contradictions and complications. This is part of the reason why his Vegas worked has been dismissed. People like simple pat answers and a lot of times they're not available. Some of the dismissal is based on retroactive if not quite revisionist history. It may be hard to believe but the majority of population did not get to see Elvis in Vegas. 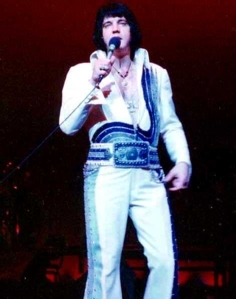 One common mistake is thinking Elvis in 1976 is Elvis in 1970 or 1972 and that simply is just not the case. The difference in him, in terms of not only performance but also physical health and demeanour, was one of light years in really that brief span. That's part of the trouble; Elvis' decline, at least physically and artistically, happened in a relatively brief span of time. From "Aloha" to "Elvis In Concert" is only a little over four years. In today's pop market, an artist might take four years between releases. When Elvis died in 1977 and EIC aired a few months later many people who had not seen Elvis in the interim simply applied that Elvis image backwards. The occasionally incoherent and overweight performer simply became ‘The Vegas Elvis’. And the relatively poor road show chock full of dispirited oldies and more bloated than usual arrangements became the Vegas Show. I swear to God, I had a cousin stop by my house when I was watching "That's The Way It Is" and she commented "Oh this is when he was fat." The evidence of Elvis' thinness was right in front of her eyes but the cliche' was so lodged in her head even visual evidence couldn't push it out. I think a lot of people did the same thing with the horn and brass heavy Vegas type arrangements and ballad heavy repertoire of the "Aloha" show. The fact that orchestra members did not even play on some rockers during the first Vegas season is not known by the mass public nor really is the swampy grit of "Polk Salad Annie". An even bigger problem is the general perception of Las Vegas entertainment. The town is famous for glitz and throwaway tricks. Playing Vegas in some people's minds puts Elvis in a class with Waylon and Madame or Sigfried and Roy. However, that's an unfair designation especially since all sorts of entertainment sell out venues across the whole country. Madison Square Garden hosts all sorts of events from the Barnum & Bailey to Muppets on Ice to The Who. Yet it has avoided a stigma. However, and I will get to this later, there is nothing wrong with putting a little show in your ‘show business’ and Vegas audiences are known to want that and audiences everywhere appreciate it. Vegas audiences are notoriously conservative due largely to the expense of staying there and the high prices of the shows there. Paying that much money you want a sure thing. With the explosion in concert prices over the years though the mainstream audience has become much, much closer in taste to the Vegas audience of the 1970s. However, that conservative taste really didn't have much of an effect on Elvis. In fact, he wound up doing most of his on-stage experimentation in Vegas using it almost as a lab for what he would put on the road. His road show was far more formulaic and staid. For instance in 1974, Vegas audiences got the R&B revamp while the road audience got the main show. In fact, although playing in the same town two months a year did bore Elvis, it also liberated him to a certain extent. The multiple shows and engagements forced him to switch things up from time to time. On the road show, an audience might get only one chance to hear "Hound Dog". Many Vegas fans had been there and done that. 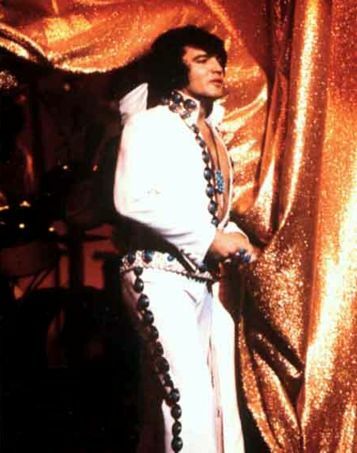 The fact that Elvis depended heavily on the material of other artists was not necessarily a concession to the Vegas audience but to the lack of good original material that plagued Elvis even in the studio. The problems for Elvis in Vegas were the problems he faced anywhere else. These included an uncritical hit loving audience and boredom. (In addition his own depression.) The problem was not that he played Vegas but that he played too often just as he was on the road, at least domestically, far too often in the '70s. Also I would argue that touring and performing so constantly kept Elvis from having enough down time to really listen to music again. In almost every studio session in the 1960s Elvis brought songs to the studio he was determined to record. This rarely happened in the 1970s. He might stumble on something like the Sun days but he rarely came into the studio with his own portfolio. I was just thinking of this while listening to the recent FTD reissue of Elvis-Today. Elvis is in superb voice but what is lacking is a sense of inspiration. Imagine if instead of just another recording session this would have been with the Boston Pops or collaboration with a writer who intrigued Elvis. 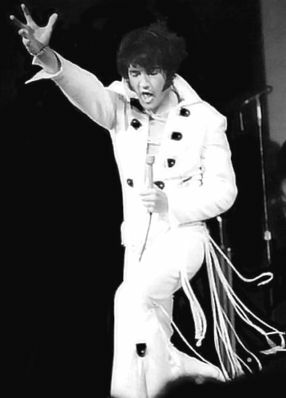 Instead it was the same old, same old and it was hard for Elvis to get it up even near the peak of his powers. Elvis' atrophy in Vegas came from the same reason as his atrophy on the road. His depression and an uncritical audience mad at simply the sight of him. Some of it course though is simple rock snobbery. Prior to 1970, Vegas was not a rock scene and was associated with the tastes of an older generation. Some of Elvis' bad reputation is punishment for daring to be aligned with the enemies of rock. That Elvis' taste drifted away from rock in the 1970s is another cause for punishment. A 1970 Richard Meltzer review of the "The That's the Way It Is" is a prime example of this. The crux of the review is a simple condemnation of Elvis for using his talents to sing ballads as opposed to rockers. That Elvis' ballads were significantly different from say Frank Sinatra (not that Sinatra's approach was bad, although it could be & in the Meltzer book is ignored). Even some of the dismissal at the arrangements, which were overdone from time to time, can be interpreted as criticism for not sounding like a rock song. The interesting thing is that at the time many rock and blues performers were starting to play Vegas. And many, many more would follow. The thing about Vegas is that it is the one part of the United States that is like Europe in that once you're a star, you're always a star. Rock and bluesmen like the Everly Brothers, Little Richard, Dion, Bobby Bland, BB King or later rockers like the remnants of The Band all have done gigs in Vegas in the past two decades because it is the one place they are always welcome. You don't need a Top 40 single there. This is perhaps the reason why some of the mainstream media have come around on Elvis in Vegas. The world has caught up with the act. Not only did Elvis' act have a profound influence on other strip performers like Wayne Newton and not only did it legitimize Vegas for other rockers but it became the forerunner of the pop music show in general. The elaborate costumes, the huge bands, the karate posturing and dance moves all anticipated not only the elaborate stage shows of acts like Kiss and David Bowie (it is the height of hypocrisy that Bowie and Elton John wore far more absurd apparel than Elvis in the 1970s but only Elvis has his music dismissed because of it) but also the extravaganzas staged by Britney Spears, Madonna, and Janet Jackson. Compared to these, Elvis in Vegas looks restrained. Elvis himself summed up this approach in an interview once when he said something along the lines that ‘you can't just stand there you have to give them something extra or else they could just sit at home and listen to the record’. With all due respect to a Nirvana or Elvis himself in 1968, sitting there on a stage and singing doesn't cut it most of the time. And the idea of a band parading out on stage in a t-shirt and jeans is way overrated. 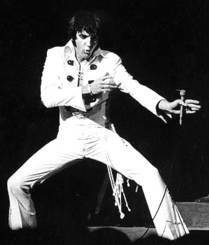 The largeness of Elvis' sound as well as the elaborate costumes and movements was an attempt to give the audience that ‘something extra’. It was incidentally also a sign of musical ambition within himself for which he is seldom given credit. But in 2005 now that rock and roll is no longer the dominant music of the age, our musical appreciation has somewhat matured and the legitimacy of non-rock music is no longer questioned. And most audiences now come to expect elaborate stage play. I think the world has finally caught up with the Vegas Elvis.